Platinum looks cheap by any measure today. Since 2011 it has nearly halved against the Pound. In Dollar terms it has fallen over 60% from its record highs of 10 years ago. And this rare, precious metal has never been cheaper against gold than in 2018. Could a contrarian investor ask for more? You can in fact save a further 0.5% using BullionVault this week. Buy any quantity of platinum before the end of September, and you will pay 0% dealing commission on your purchase. I can't say if buying platinum is right for your personal situation right now. You should seek professional advice if you're unsure of the risks. Nor are contrarian opportunities like this guaranteed to pay off. They can take a lot of patience. And they also mean going against the crowd. Analysts could not look more bearish towards platinum. Short-term traders are betting against it like never before as well. Yet this rare, precious metal has thousands of uses across today's energy, chemicals and medical industries. It also competes with gold for jewellery demand in China, Japan and increasingly India. So why is it trading at this historic discount? Platinum's largest use today comes in diesel vehicles. Used properly, a platinum catalyst cuts harmful emissions by up to 99%. But stopping and starting in city traffic means the platinum cannot do its job, because the catalyst does not reach the right temperature. Hiding this as several manufacturers did was shameful. Platinum is part of the answer however, not the problem. Whether or not you believe in man-made climate change, diesel cars on average emit 20% less carbon dioxide than a gasoline car. That makes diesel fuel "critical" to meeting greenhouse gas targets, say motor trade experts. Because it is richer in energy, diesel will retain a market-share in Europe's lorries and other heavy-duty vehicles of more than 90% well into the next decade according to leading forecasters. China is also raising its emission standards sharply, requiring more metal in each catalyst. In fact, global catalyst demand for platinum held strong in 2017, finishing above its 5-year average. Money managers as a group have now been betting against platinum for more than 12 months on futures and options, even while they placed near-record bullish bets on the other precious metals. Most dramatically, that has seen the price of palladium – used in catalysts for gasoline engines – overtake platinum for the first time since 2001. 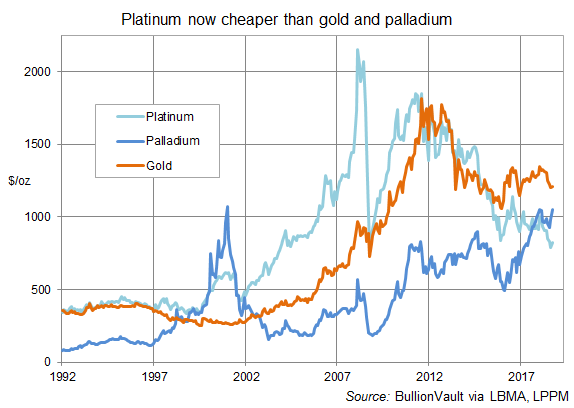 ​Platinum's discount to palladium could continue; last time it ran for 18 months. But while palladium can only be used in gasoline catalysts, not in diesel, platinum can be used in both. Palladium is also more exposed to over-indebted US consumers, because they only buy gasoline cars. And long term, palladium will suffer much worse than platinum as the world slowly moves away from the internal combustion engine. Palladium today finds 80% of its total demand from autocatalysts. For platinum that figure is just 40%, because it is a more versatile metal. Besides auto makers, a huge range of industries today use platinum to accelerate chemical reactions. Platinum catalysts help make petroleum products, fertilizers, plastics, synthetic fibres, dyes and medicines. Heavier, harder and rarer than gold, platinum is ideal for jewellery. This now accounts for one-third of demand, led by China. The least reactive metal on earth, platinum is safely used in pacemakers, and platinum-based drugs block the growth of cancer cells. Because it doesn't corrode, platinum is vital in industrial thermo-couples, plus electronics from LCD screens to computer servers. Most exciting, fuel cells using platinum catalysts are a serious contender for powering the cars, buses and trucks of tomorrow. Mixing hydrogen with oxygen, they generated electricity on the NASA moon landings. The latest cars refuel in minutes and emit nothing but water. Japan is making Tokyo 2020 the 'hydrogen Olympics', building a clean-energy future like its 1964 Games built the high-speed Shinkansen rail system. As for supply, today's low prices are putting major miners at risk. Output from South Africa, the largest producer, has already fallen by 25% over the last decade. Global stockpiles have shrunk on 5 years of deficit, with demand outstripping supply. Current levels of mining output are simply unsustainable long-term at today's prices. Of course, none of this guarantees that platinum prices will rise sharply as 2018 ends. The bearish consensus could well cap or hurt prices in 2019. But if this contrarian opportunity appeals to you, how can you buy this rare, uniquely useful precious metal? Physical platinum has to date been difficult for private investors to buy and trade efficiently. The VAT on small bars or coins made it uninvestable for UK residents, adding another 20% on top of dealing spreads costing you 10% or worse. But while many private investors like to hold bullion in their possession, a large and growing number prefer owning precious metals securely in professional storage. BullionVault is the global leader online. Today we care for $2bn of client gold and silver. Now you can buy platinum VAT-free, and hold it fully insured in specialist vaults in London, ready to sell at full value the moment you choose. To help you get started, our partnership with the World Platinum Investment Council means you can buy any quantity in September and pay 0% dealing commission on your purchase. If you have any questions, please do contact our Customer Services team using the details below. PLEASE NOTE: This email is published to inform your thinking, not lead it. Only you can decide the best place for your money, and any decision you make will put your money at risk. If you are not able to assess this information, seek professional investment advice. Information or data included here may have already been overtaken by events – and must be verified elsewhere – should you choose to act on it.